Hey guys been a member on here for a while but haven't been very active. Anyway for a little background, I live in Barbados in the Caribbean which is a pretty small island. Despite the obvious benefits of living on a tropical island like all year good weather and lovely beaches, our duties on vehicles here are crazy (over 200+%) and also there are serious restrictions on vehicle importation for instance nothing older than 4 years which automatically rules out any s30 Zs. However I have always wanted one of these cars so I was left with the only legal option of importing a shell or basic chassis and building a car from scratch. I spent some time scouring the net for just that and finally found a 280z in pretty good condition and the owner was willing to strip it to the point I wanted. He had done a basic restoration a few years back to the point of primer but it was too rough a job for my purpose so I decided a full strip down from the ground up was in order and at the same time I would modify to suit. 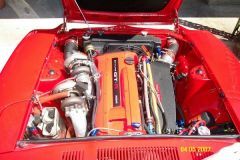 One of the issues I faced was that there were no other driving Zs on the road and just a couple S30 shells lying around and since the body came missing most parts I would have to educate myself thoroughly on the workings of the car. Also because of the unreliable work ethic of many persons available I decided that for the fun and general experience of it I would undertake the restoration and modification almost exclusively along with a good friend. This naturally required somewhere to work and the tools to get the job done, so my first order, even before I had the car was to start getting the tools I didn't already have. It's been an on and off 3 year project so far and still not done. The car in it's original state when I first got it. Looked decent from far but far from great... Of course after stripping some rust issues were found but all in all was pretty good. After the rust areas were dealt with the next plan was to convert the car from LHD to RHD since that is the side of the road we drive on here. Finding donor parts prooved to be a bit of an issue so we eventually decided that the only real way was to fabricate everything from scratch. So we made up a couple templates and pulled out our spot weld remover bit and got to work. The next step was getting everything stripped down to metal and epoxy coated. Best way for this would be a rotisserie so that was our next project, building one. Then the fun could begin... After hearing alot of horror stories about 'professional' sandblasting services I decided to blast the car myself with a small blaster from eastwood and some glass. It was NOT fun. But the results were rewarding. 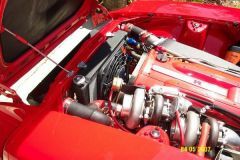 Looking for an RB26DETT with the RWD conversion to install into my 75 280z. I will arrange shipping if needed. I can pick up if within 300 miles of Lake Charles, LA. Must be in running condition with little rebuild needed. Harness is a must as well. PM me if you have anything. Gather around folks I'm building my dream car. Some may know me here, some may not. I've been building nissans for 15 years now. My last personal build started in 2009 on this forum but I stopped documenting after 2011. I just sold my entire setup to my best friend, which I also sold my 2nd 240z too. So I'm starting to document a new chapter in my build. I tore down my black car and we are completely rebuilding my friends orange one better than ever. The original setup was amazing, never let me down. R34 NEO motor, GT35R, Tein coilovers with edfc, clsd, axles, wilwoods.... etc. This brings us to my new build and it's current state on my rotisserie waiting to get massacred. I'll post some photos and get this ball rolling Donor car was an ever so gracious R33 GTR Vpec, 90% of parts came from the same car. I will be grafting front and rear sub frames into my Z chassis, including the AWD system, Brembos, suspensions (tein), Axles, Diff, etc from the GTR... I've even gone ahead and gotten the GTR pedel set and Master so she should feel as GTR as possible from inside. Steering column, steering rack all modern and hydraulic (and left hand drive ) I've collected 90% of the bizarre hardware associated with the awd system too. Also will be doing GTR gauges, chassis strengthening, new wiring, wheels, so on and so forth.... My old car was quite the track beast, I intend to make this one deadlier than ever. More so I just love building so I'm doing it Grab some popcorn, this ones going to take a minute! Emissions standards per location - too good to be true? 240 vs 280 for RB26DETT project, your opinion ? Hi Guys, As a project car I am looking into a 240z or 280 now, even 260 is an option. I have used this forum to find most of the differences between the 2. But still can't decide which chassis would be the best start. I want a RB26dett swapped in. Car will be used as street car for fun and occasional race car, certainly not a daily car. Initially I preferred a 240z, series 1 or 2, since those are the originals, less weight, less extra's etc. But the 280's are easier to find in good condition (all I care about is the body, rest (engine etc) will be swapped anyway), and they have a stiffer (but heavier) chassis to start with. Some cosmetic differences could be changed, such as the 280 bumpers, since i prefer the 240z look. But in terms of the RB26DETT swap, what would the better route? 240 or 280? Other then finding the 280 easier in good condition, what are the REAL benefits for such a project? Any opinion, ideas or comments are appreciated.